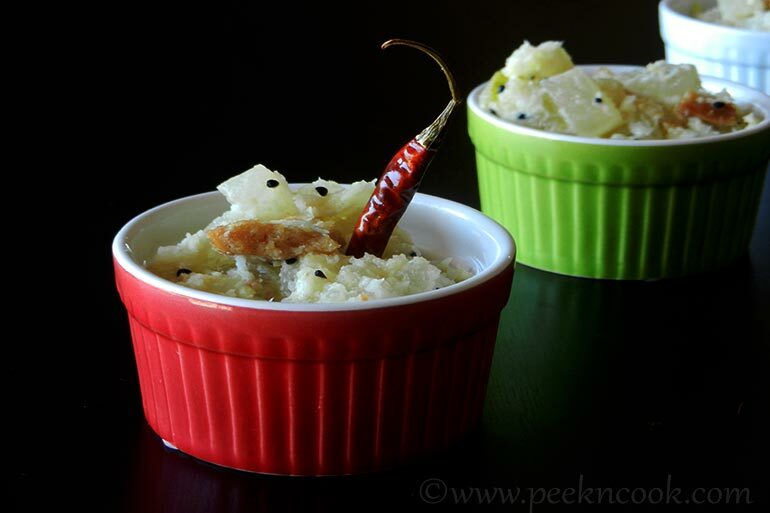 Chal Kumro ( White pumpkin) is a dish that is part of the Bengali cuisine of East India. It is prepared from white pumpkin, grated coconut and Nigella seeds seasoned with vegetable oil. This dish is served with steamed rice at the first of a lunch menu. It is prepared from white pumpkin, grated coconut and Nigella seeds seasoned with vegetable oil. This dish is served with steamed rice at the first of a lunch menu. Take white pumpkin peel it and chop it and put into a bowl and wash it and keep aside. Take a pan heat oil and fry the Urad Dal Vadies and keep aside. Now add whole red chili and some Black Mustard seeds into the same oil and fry till the Black Mustard seeds splutters . Add the chopped white pumpkin and some salt to it and cover the pan and simmer the stove for 10 minutes. After 10 minutes open the lid add the fried Vadies and higher the oven to evaporate all the water which came from the pumpkin. When all the water will be evaporated add some sugar and keep frying the pumpkin. Add some grated coconut to it and pour the pumpkin curry in a bowl. This curry should be served with steamed rice as lunch. Authentic delicious Bengali vegetarian dish. This dish should be little sweet.